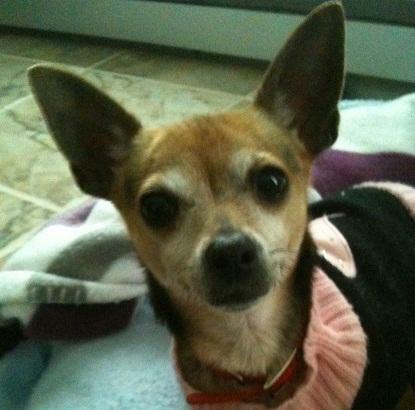 Bonita is a sweet little adult Chihuahua that loves to snuggle with the ones she loves. She arrived at the Delco SPCA scared and unsure of everything and everyone, so thankfully an experienced foster home stepped in to help socialize her. Currently, Bonita shares her temporary foster home with another Chihuahua, and she cuddles with him all the time! She also gets along with dog-friendly cats. She is most comfortable around other animals, so she hopes her new home has at least one of them! Bonita loves to play with toys, especially balls and stuffed toys. Due to crystals in her bladder, Bonita must eat a special prescription food daily to avoid any blockages. The Delco SPCA offers this food at a discount! Her shy tendencies require a patient home, ready to move at her pace. When she finds someone who will give her a lot of TLC, she comes around. 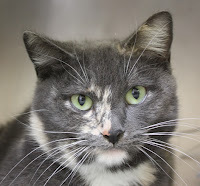 Beautiful Bonita is already spayed, vaccinated and microchipped, so she is ready to go home with you today! E-mail foster@delcospca.org or call 610-566-1370 to set up a meeting with Bonita today! Young Tori, a striking dilute Tori, looks like a very dainty cat, but since she’s so easy-going, she’s truly anything but dainty! So, don’t let the proper appearance and beautiful markings fool you. Tori came to the Delco SPCA in November. It’s now January, and she’s just desperate for a furever home. Tori would be best suited to a home with a patient owner who realizes that sometimes kitties need time to feel safe and secure before they show their true loving nature. Tori will blossom again with love and patience, so please consider giving her a second chance to find a furever home that really is forever. On Thursdays, Tori is just a $23 adoption fee in the Delco SPCA’s Lucky Number 3 adoption special! Hurry in and meet pretty Tori today! She is already spayed and up-to-date on all of her shots as well as microchipped! Hours for adoption are Tuesday through Saturday from 12:00 to 7:00 p.m. and Sunday from 12:00 to 4:00 p.m. Interested in advertising or sponsoring the Delco SPCA’s Rescued on the Runway fashion show on March 8? Call or e-mail Justina at 610-566-1370 x231 or jcalgiano@delcospca.org for more info. Throughout the year, the Delco SPCA is offering an Alley Cat Special in which a cat can receive a physical exam, spay/neuter, necessary vaccinations and FeLV/FIV combo test for just $75. Call 610-566-1370 option 3 to book an appointment for your cat or an alley cat today. For more information on adopting a pet or to see other pets, please contact Delaware County SPCA or visit them on the web at www.delcospca.org. ** The Delaware County SPCA is in need of towels, blankets, peanut butter, newspaper and much more for the pets. Check out the entire list of items needed here. If you would like to donate anything, please take them during the hours of operation.